This probiotic supplement by Puritan’s Pride covers a fair amount of ground and manages to keep its price low enough to be easily affordable for those who don’t want to spend too much on digestive health. It’s especially suited for small immune system boosts, and overall digestive health function. 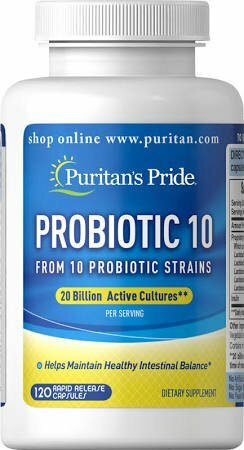 Lactobacillus and the other strains in Puritan’s Pride Probiotic 10 can be expected to help aid digestion, especially digestion of dairy, and provide a small boost to the overall immune function. 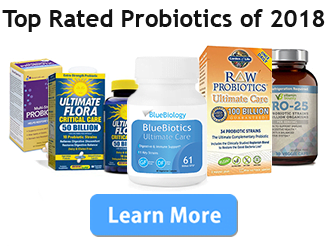 With 20 billion active cultures, this supplement delivers an effective dose of probiotic bacteria, and the strains included cover enough ground to be helpful for a few different things, including IBS related symptoms, diarrhea, and digestive discomfort. With mostly different subspecies of Lactobacillus in this blend, the health benefits are somewhat limited. This also uses a gelatin capsule and contains milk ingredients, so it is not suitable for vegetarians, vegans, or for those who are lactose intolerant. Without enteric-coating users can’t rely on results, as the strains may or may not survive the stomach acid to populate the gut. Probiotic 10 is available in stores. You can find information about where to buy Puritan’s Pride Probiotic 10 on their website, puritanspride.com.